Just today I received a wonderful email from a man I just happened to run into a few months back in Valley of Fire State Park in Nevada. 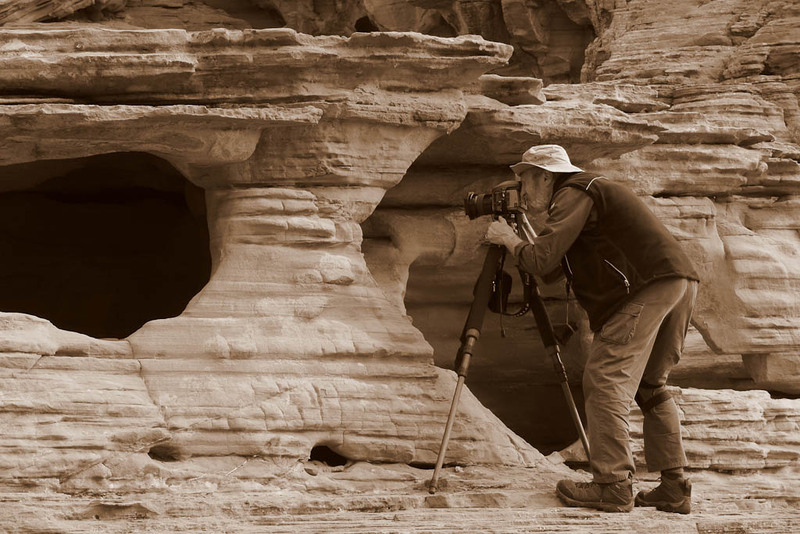 I was busily photographing the glorious rock formations in this jewel of a park, when a man approached me and told me I looked remarkably like Ansel Adams, hunched over my camera as I was. How to take that comment? I was flattered beyond words, hoping that he did not mean that I looked half-dead. But this man, Bob Stowe, was in town for a conference and he seemed like a nice guy. We chatted a while about photography. Bob was sporting a nice camera and looked like he was having a grand time during his afternoon off. Bob, I’d like to publicly thank you. What a nice thing to do! Now, even nice gestures sometimes create conundrums. and this one created a B-I-G one for me. Bob sent three versions of the image and told me to choose whichever one I wanted. Fair enough. One was the original color shot. The second image Bob rendered in B&W. And the third… well here is where it gets sticky. The third image Bob processed in sepia tone, conveying the old-timey feel of Ansel Adam’s time. This, Bob confided in me, was his wife’s favorite rendition. Ah, and now I’m supposed to pick one, eh Bob? So, in the interests of marital harmony and the higher purposes of life, I decided on… the sepia one, naturally (click on the image to enlarge). Teasing aside, thanks to Bob (and Ruth) for the gift. Have a great week!